Meachers Global Logistics, one of the UK’s leading independent providers of international freight and transport logistics services has offered to support, REIDsteel to help transport steelwork on a 4,000 mile journey from Dorset to the Caribbean for the reconstruction of a primary school, devastated by hurricanes Irma and Maria last year. A consortium of businesses in the UK which have joined forces to help rebuild the Enis Adams Primary School in the British Virgin Islands are providing support free of charge, in kind or at a discounted rate to the total value of £35,000. They are Meachers Global Logistics, REIDsteel, Tata Steel, National Tube Stockholders, Joseph Ash Galvanising, Euroclad, Ayrshire Metal Products, BAPP, Powell Gee & Co Ltd and Kestrel Liner Agencies. Meachers has offered their support and services to help ship steelwork and supplies to the British Virgin Islands for the project. Main contractor in Tortola, Newton Construction Co Ltd is leading the construction work and will erect the steelwork. 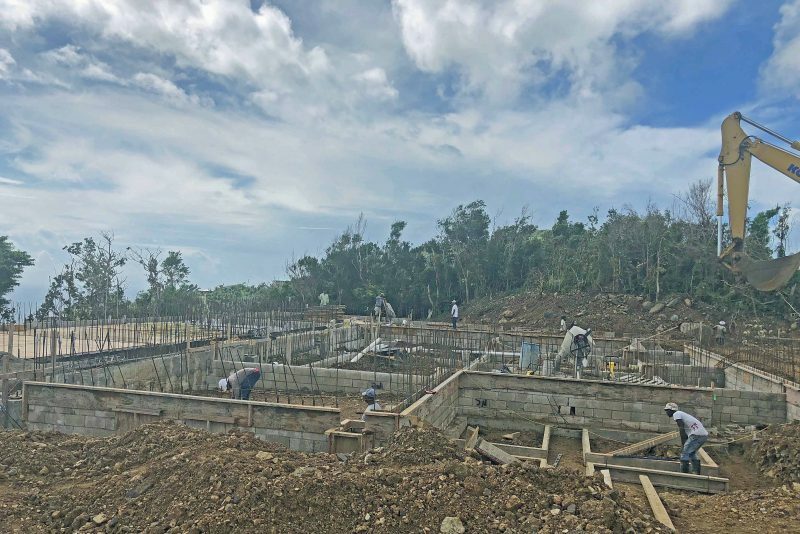 Virgin Islands businessman Peter Haycraft has pledged $1m of his own money for the school reconstruction to help the local community. Now four 40’ cargo containers full of steel work are being shipped across the Atlantic for the project on the island of Tortola, with three more to follow in the coming months. REIDsteel commercial director Tim Cook said: “We have built strong personal and professional relationships over many years in the Caribbean. “It was terrible to see the damage wreaked by the hurricanes last year so we’re very grateful to Peter Haycraft for giving us the opportunity to help him give something back to Tortola. 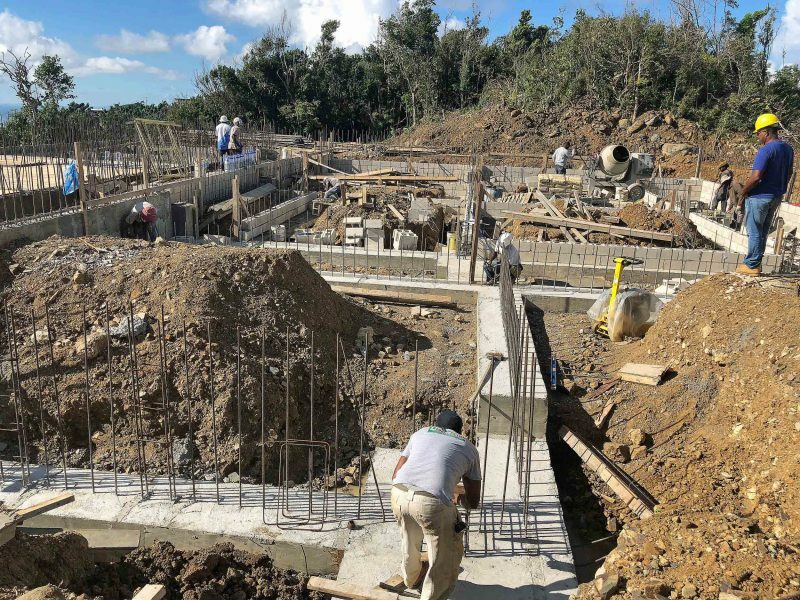 Work continues on new Enis Adams Primary School on Tortola in the British Virgin Islands. Others involved in the project are architect AEMC Architectural Services, Civil Engineer AEC Consulting Engineers Ltd, Electrical Barry’s Electrical Services, Reliable Plumbing, S & D Security, and the British Virgin Islands Ministry of Education and Culture. Hesketh Newton, managing director of Newton Construction Co Ltd, said: “We have made good progress so far and the new school will really begin to take shape with the arrival of the steelwork. The first ground has been broken for the reconstruction of the school, which is due to open in September 2019. 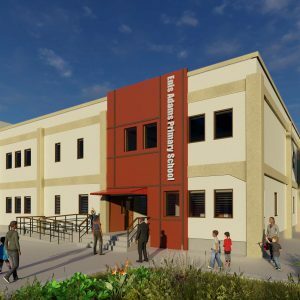 It will have state of the art classrooms with smart boards, computer suites, library, solar panels, wheelchair access and therapeutic suite for instruction of specially gifted kids. Tata Steel is helping with the supply of ComFlor® floor decking and providing Colorcoat® pre-finished steel including Colorcoat Prisma®, whilst Cardiff based Euroclad are giving finished roof systems. Barnsley-based BAPP has supplied industrial fasteners and bolts, Powell Gee of Shrewsbury has supplied fixings for floor decking and the external cladding envelope. Kestrel Liner Agencies, a global Caribbean shipping specialist which offers weekly sailings from more than 145 ports to the Caribbean basin, is helping with shipment and Meachers Global Logistics with shipping services. Andy Thorne, Kestrel group chairman, said: “In the immediate aftermath of Hurricane Irma and Maria we were able to get people on the ground and provide specialist logistical and financial support to the region.